It’s here! It’s really here! The first day of Spring! The crowd is going WILD around here! I am SOoooo… ready to pack away the parka, dust of my bicycle, and prepare for warmer weather. Ok, I do live in Canada so just because the date on the calendar is here, realistically there is still a lot of snow, and if I didn’t wear my parka I’d be frozen to the core. Buuut… one thing I can do is freshen up my house with a few bright colors. A new Spring Wreath is in order! If you’re following me on Instagram you would have seen this shot I posted last week from my crafty shopping trip, getting prepared to make this awesome-ness! Isn’t it fun?! I picked up a handful of fabrics this past weekend, most were expensive so I just got the minimum cuts. 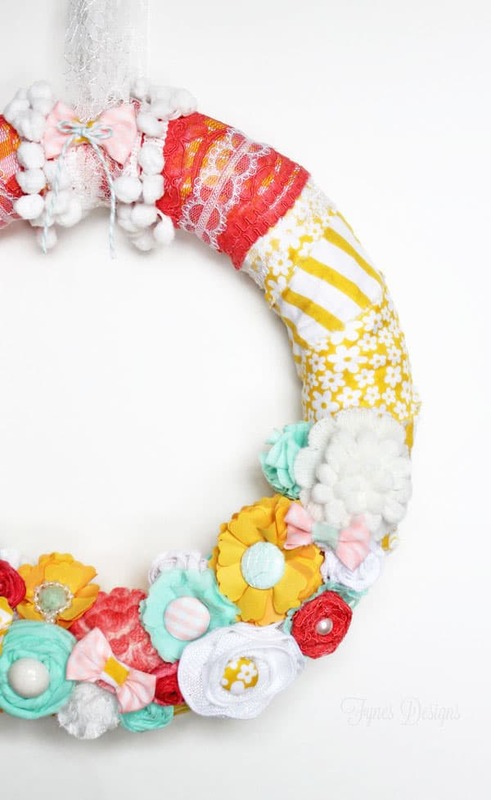 A fabric covered wreath is a great way to use leftover fabric from any project. 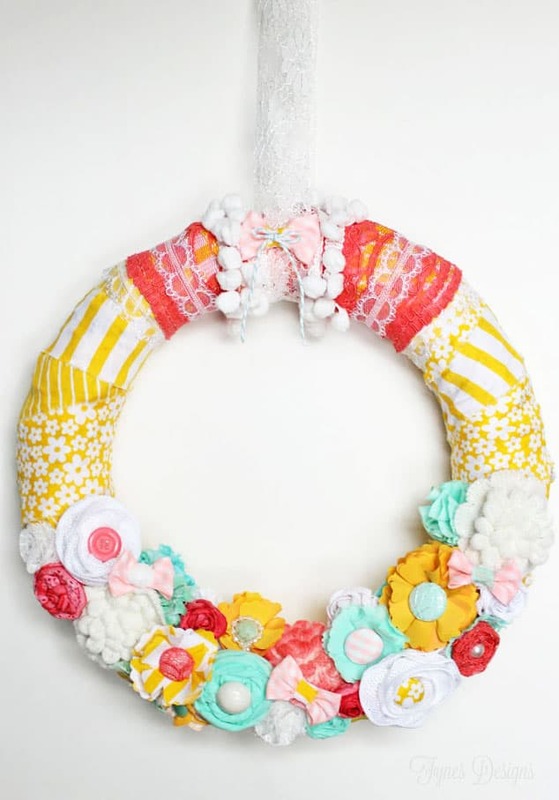 This Spring wreath will give your home a bold splash of spring color! I embellished the wreath with fabric and ribbon flowers and added fabric covered button details. I added in burlap flowers using the same technique that I did for my basket wreath last summer. Then I bought a few Jolees knit flowers from Michaels. 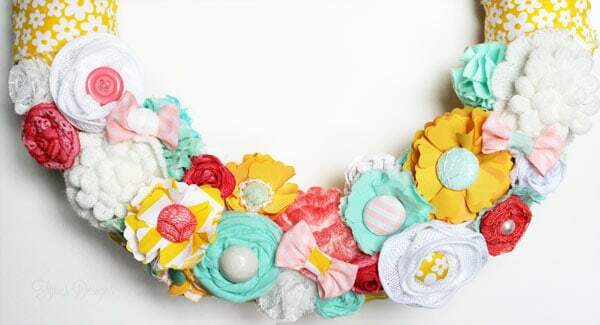 The May Arts pom pom trim and lace added a cute retro touch to my Spring Wreath. I had a bit of fabric left over, which is quite surprising since I only bought 8″ of each fabric. I made a few zippered pouches to give as gifts. Although I do love them a lot… can I part with them? I followed the same tutorial I mentioned in my leather corner zipper pouch last week! Have to stop messing around and go get my bags packed, Crop and Create here I come!! 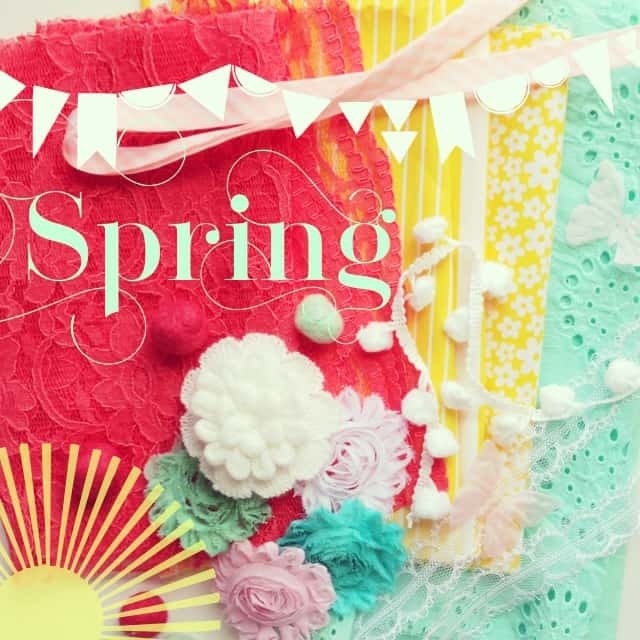 Thanks for stopping by to check out how I’m Welcoming Spring! I’d love to know how you are bringing spring into your house? That screams CHEERFUL!!!! It’s super cute and I can’t get over the matching pouches. Can you please come here and teach me how to sew? Oh it sure does speak ‘spring’!! Bring it on!! But like you, we’re still cold, snowy and see very little grass around here. But your wreath is so pretty, bright and colourful! And I love the little pouches, too. I love this, Virginia! Your work is always so lovely. And I’m crushing on that lace pouch you made. Gorgeous! This is a gorgeous wreath!! L-O-V-E!! Such a lovely wreath! I love the lace and flowers and buttons and bright colors! I’m pinning it! Oh my goodness – – I love EVERYTHING you do and this wreath is no exception. The colors and fabric you chose are just heavenly. Well done! Your wreath is just super cute, I like the colour combination! 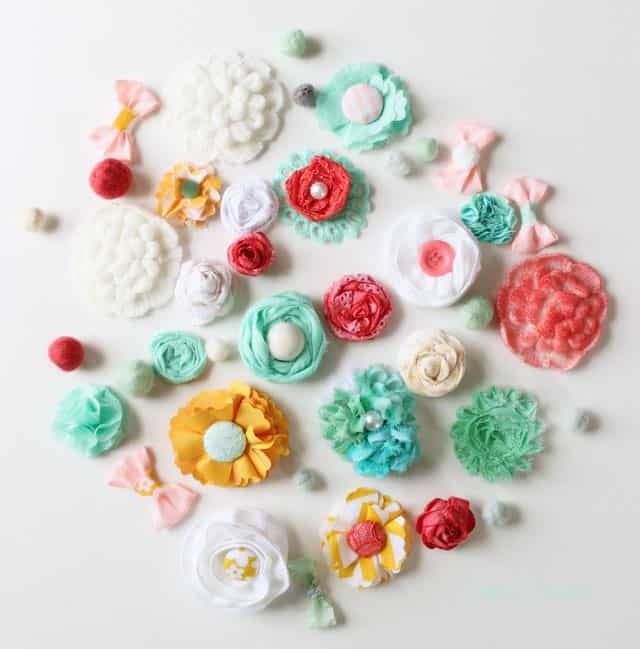 Is there a tutorial on how to make those adorable flowers??? 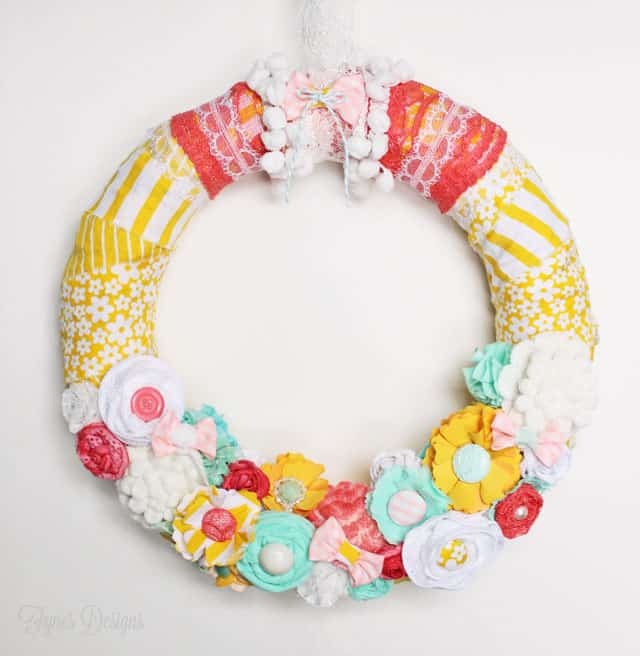 Hi Monica, there is only a tutorial on how to make the faux burlap flowers, which you can find here –> https://www.fynesdesigns.com/nautical-decor-wreath-and-a-day-by-the-ocean/ If you search rolled flower, and felt flower, there are hundreds of tutorials. Thanks for stopping by! Beautiful wreath. Happy Spring, I hope your snow melts soon! I’d love it if you shared this over at The Makers link party going on at my blog right now, UpcycledTreasures.com. Hope to see you there! 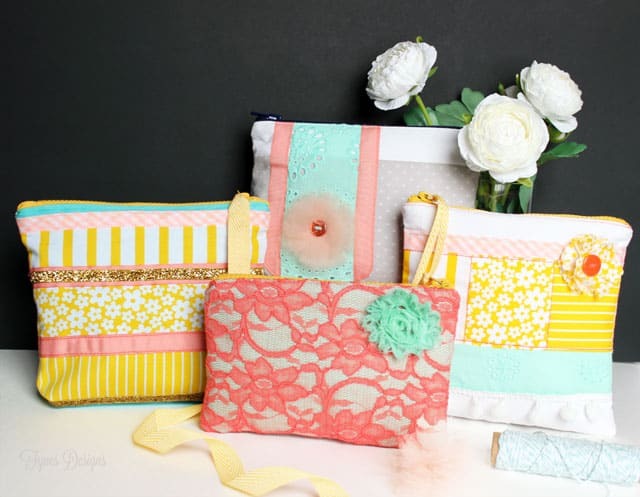 So fun, cheery and just plain adorable! Saw this featured at Making Home Base. So bright and pretty. This is so absolutely adorable Virginia- I absolutely love it!! So so so so cute, girl!! LOVE it! Super cute… Pinning and sharing on Facebook! SO pretty! I love these colors.